Some of the things that happen regularly in our village …..
What is Menter Siabod ? 1. From the car park walk back into Dolwyddelan and continue to A470. Cross main road and walk up the hill, past post office and toilets on left. At junction turn right then left over stile into field.Walk to top right corner and cross stile into next field. Pass a house on left and follow drive ahead, with good views south. Go over cattle grid and turn left onto track. At junction with forest track turn left. Follow track, ignoring footpath on right. Bear left at track junction, soon crossing a footbridge. 2. This path between the villages is named Sarn yr Offeiriad path – as the priest used it travel between his churches. A simple stone clapper bridge, Pont Sarn Offeiriad, formerly crossed the river. Continue on the clear track through the felled forest ignoring paths on either side. 1km after the first bridge cross the river again. Ignore first track on right but bear right at track fork 50m later. Ignore next track on left but after 100m turn right onto an old track leading to the moorland. Cross stile by gate and follow old track across the moors. Soon after crossing another stile look for the remains of Bronze Age hut circles on the left. The track now gradually descends with superb views north. Cross a grassy track and follow path ahead downhill, crossing a stile to walk down to a lane. Turn left and follow lane over a stone bridge to A5. 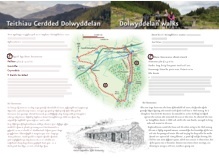 Turn to Bryn Glo car park and cafe or left to Capel Curig (buses run to Betws-y-coed). Brief route directions are given but it is essential that you also take an OS 1:25000 Explorer map, as few routes are fully waymarked. Routes that cross the moorland need particular care and good map-reading skills. 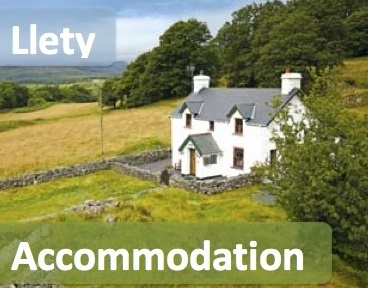 Please follow the country code and make sure you keep dogs under control, particularly near livestock. Rough distances are given in the routes directions. As a guide allow 15 kilometers per kilometer walking at an easy pace on the flat but allow an extra ascent(roughly 1 minute per 10m of ascent). Overall timings for the walk are s are generous, allowing time for stops. Walks require walking shoes and warterproof clothing and always take food and water. Some routes through the forest and moor can be very boggy.